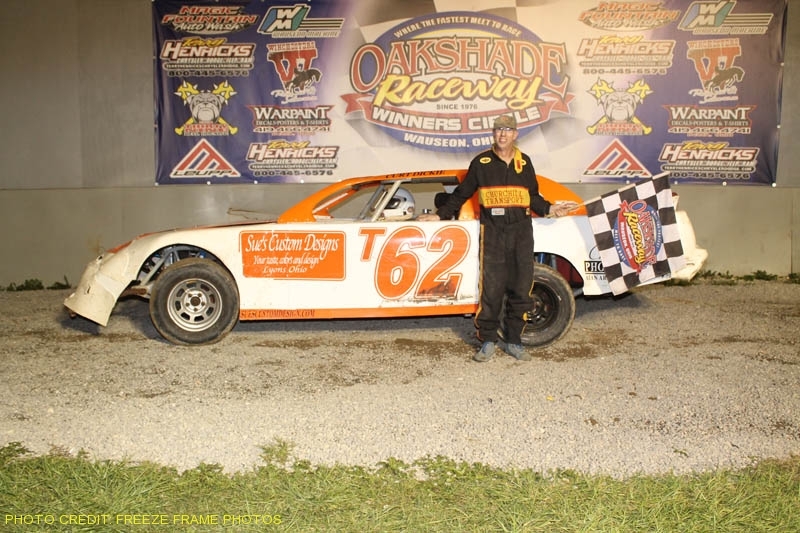 Duane Chamberlain from Richmond, IN added his name to the prestigious list of winners of the Barney Oldfield Race at Oakshade Raceway on Saturday night. “Insane Duane” Chamberlain started outside the third row of the 40-lap Barney Oldfield Late Model feature and quickly worked his way toward the front. Zack Olger jumped out to the early lead over Curtis Roberts, but Roberts closed in and took the lead away by lap three. Roberts began to pull away from Olger and went on to lead most of the race. Chamberlain moved into the second position on lap 14. The first of only two cautions in the race came out for Tim Sabo who lost his car off the high side of turns one and two on lap 25. The second caution came out on lap 33 just after Chamberlain made an impressive pass for the lead on Roberts coming through turn four. The caution was a temporary reprieve for Roberts who regained the lead since he was scored as the leader on the last completed green flag lap. Chamberlain began to mount another charge for the lead in the closing laps of the race and with three laps remaining, dove to the inside of Roberts in turn one and almost had him cleared as he slid up in turn two. The two drivers made contact with Roberts having to check up allowing Chamberlain to take the lead and the eventual victory. Chamberlain apologized to Roberts after the race for the contact on the track acknowledging he knew the laps were winding down and he had to make his move. Chamberlain was presented with the Barney Oldfield trophy sponsored by Raceway Energy’s and Wyse Excavating of Wauseon and a check for $4,200. Roberts had to settle for a second place finish. Casey Noonan had challenged for the lead midway through the race, but fell back to finish third ahead of Brian Ruhlman and Rusty Schlenk. After finishing fifth in the Late Model feature, Rusty Schlenk brought out his Racer’s Connection sponsored 28z UMP Sportsman to try to win his fourth Sportsman feature in a row. Schlenk started on the outside of the front row with Sportsman rookie Billy Ruff to his inside. Ruff jumped out to the early lead, but Schlenk passed him on lap two. Tim Fisher and Steve Kester got hooked together going down the backstretch on lap nine causing a melee in turn 3 to bring out the second yellow flag of the race. After the restart, Josh Steinacker, who is the only other Sportsman driver to win a feature this year, put the pressure on Schlenk for the lead. The two drivers raced side by side for several laps, but Schlenk was too strong and eventually began to pull away. Schlenk’s dominance in the UMP Sportsman division at Oakshade continued as he won again. Steinacker finished second with Chris Keller finishing third. All three of those drivers also drive in the UMP Late Model division at Oakshade. Bruce Stuart was the highest finisher of the Sportsman only drivers in fourth with the defending Sportsman Track Champion Ray Klawitter in fifth. Once again, the Bomber A Main featured one of the best finishes of the night with multiple lead changes on the final lap. The race was marred by a slew of caution flags, including one that took out Jake Rendel who won last week’s Bomber A Main and was sitting second in points coming into the night’s events. Rob Anderzack was passed on lap three by Craig Dippman for the lead. Dippman got loose in turn two and Anderzack, Jim Scout and Tom Ordway all got by for the top three positions. Ordway was on a mission in the closing laps, taking second from Scout with two laps to go. Then on the final lap, Ordway and Anderzack exchanged the lead several times setting up an exciting finish with Ordway just edging out Anderzack for the win. Bomber points leader Jim Scout had the best seat in the house to watch that battle as he finished third just behind the two leaders. Craig Dippman maintained a fourth place finish with Kyle Light posting a fifth place finish. The Bomber B Main was also slowed multiple times for caution flags but featured some excitement for the lead. Karl Spoores was leading and began to work through slower traffic at the back of the field. Brian Przepiora was breathing down his neck in second and made a bid for the lead to the inside of a lapped car and Spoores went high to make it three wide. Soon after the race for the lead began to heat up, a caution came out for BJ Gregory who spun and Brandon Burton piled in hard that would end both drivers nights and put the field back single file for the restart behind Spoores. Spoores held on to win his second Bomber B Main of the year with Przepiora finishing second. The rest of the top five finishers were Dave Sibberson, Scot Mills, and Chris Williams. Jerry Signor dominated the Bomber C Main. After taking the lead from Justin Woodruff on lap two, Signor took off and didn’t look back opening up just about a straightaway advantage over the second place finisher Jeff Krotzer. Dusty Sauter finished third followed by Woodruff and Gene Potridge. The Butch Wildermuth Memorial takes place on Saturday, June 24 at Oakshade Raceway featuring an American Late Model Series event paying $3,000 to the winner. UMP Sportsman and Bomber divisions will also be in action with gates opening at 4pm and racing at 7pm.